Arun Sharma, PhD, research assistant professor in Urology, has been working on innovative approaches to tissue regeneration to improve the lives of patients with urinary bladder dysfunction. Anyone who has suffered an injury can probably remember the after-effects, including pain, swelling or redness. These are signs that the body is fighting back against the injury. When tissue in the body is damaged, biological programs are activated to aid in tissue regeneration. An inflammatory response acts as a protective mechanism to enable repair and regeneration, helping the body to heal after injuries such as wounds and burns. However, the same mechanism may interfere with healing in situations in which foreign material is introduced, for example when synthetics are grafted to skin for dermal repair. In such cases, the inflammation may lead to tissue fibrosis, which creates an obstacle to proper physiological function. The research group of Arun Sharma, PhD, research assistant professor in Urology, has been working on innovative approaches to tissue regeneration to improve the lives of patients with urinary bladder dysfunction. Among their breakthroughs was a medical model for regenerating bladders using stem cells harvested from a donor’s own bone marrow, reported in the Proceedings of the National Academy of Sciences, in 2013. More recently, the team has developed a system that may protect against the inflammatory reaction that can negatively impact tissue growth, development and function. Self-assembling peptide amphiphiles (Pas) are biocompatible and biodegradable nanomaterials that have demonstrated utility in a wide range of settings and applications. Using an established urinary bladder augmentation model, Sharma’s group treated a highly pro-inflammatory biologic scaffold used in a wide array of settings with anti-inflammatory peptide amphiphiles (AIF-Pas). When compared with control Pas, the treated scaffold showed regenerative capacity while modulating the innate inflammatory response, resulting in superior bladder function. This work is published in the journal Biomaterials. “Our findings are very relevant not just for bladder regeneration but for other types of tissue regeneration where foreign materials are utilized for structural support. I also envision the potential utility of these nanomolecules for the treatment of a wide range of dysfunctional inflammatory based conditions,” said Sharma. 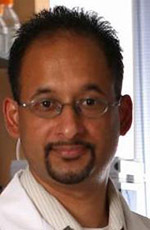 Sharma is also director of Pediatric Urological Regenerative Medicine at Ann & Robert H. Lurie Children’s Hospital of Chicago; director of Surgical Research at Stanley Manne Children’s Research Institute; assistant professor of biomedical engineering at McCormick School of Engineering; and a member of the Developmental Biology Program of the research institute. The research team includes members of the Departments of Urology and Medicine at Feinberg; Institute for BioNanotechnology in Medicine (IBNAM) and the Departments of Biomedical Engineering, Materials Science and Engineering, and Chemical and Biological Engineering at Northwestern University and the Department of Urology at Loyola University Health System. This work was performed in collaboration with the Stupp Laboratory at IBNAM.